Edwardian style oval diamond cluster - made in Chichester, England. Our dedicated designers, goldsmiths and stone setters work closely with a clients' brief to create original ideas that ensure your design is beautifully unique. From sketching out the basic idea, through CAD design, rapid prototyping, casting in our own over-pressure and centrifugal machines, expert goldsmithing to bring the rough metal components to life and finally the very highest standards in diamond and coloured stone setting - we do it all! Early 20th Century style sapphire and diamond platinum cluster ring. Made in Chichester, England. From re-modelling old fashioned but sentimental jewellery to creating the weird and wonderful, our work is always interesting. Most of the rings we make for our stock are bespoke, as nearly every fancy shaped diamond or coloured stone is unique in its proportions. This means we have the chance to design and make different style rings every time we buy new stones which makes our job so enjoyable. We do make classic diamond solitaires but even with these, which we can reproduce from the same model, we get tempted to add little design features to make them that little bit different. Inspiration can come from our customers’ ideas, from antique jewellery, from the natural world and from contemporary fashions. One the most popular styles at the moment is the early 20th century style, from the delicate fine lace-like designs of the Edwardian period to the bolder, more geometric and later Art Deco look. Look through a comprehensive folder of images of jewellery (mostly rings) that we have made here in our Chichester workshops to see how varied our work can be. Below is a small selection but you can click here for the full pages. 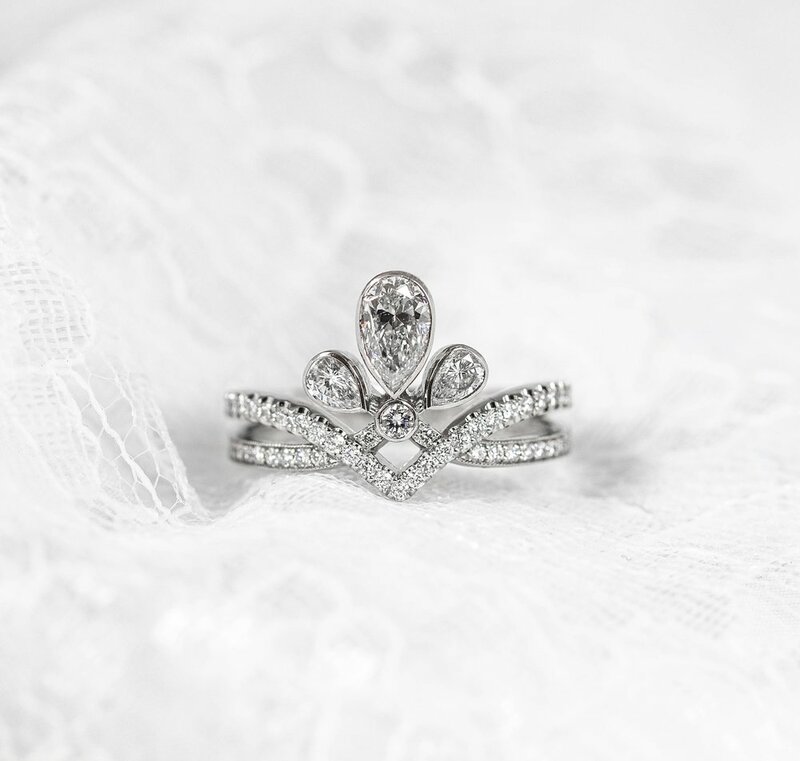 From a 1980’s seven stone claw set ring to a finely set Edwardian-style daisy cluster. - We added a little 18ct gold, platinum and some extra diamonds and got one happy customer! And now for something a little different…. Skulls, hearts and angel wings combine in this middle ages -inspired solitaire. Three opals removed from a tired early 20th century ring, transformed into a triple cluster and instantly more wearable! For a wise customer that just loves owls. An owl cuff in antiqued sterling silver, 3d modelled in Zbrush. A partially finished pair of gold cufflinks for a golfer. The South Downs are in the background and the golfer yet to be fitted. 0.70ct D colour oval with natural pink and white diamonds - made in Chichester, England. With an understated and yet confident aesthetic Kit Heath is renowned for their classic and contemporary designs. This collaborative family are synonymous with a great sense of style with award winning collections that have been designed with layering in mind. All designs are in 925 sterling silver, rhodium plated with either a 9 or 18 karat yellow gold plating. The brand allows its customers to experiment with design with an affordable price tag and luxury feel. We sell the naturalistic jewellery of Alex Monroe. Alex Monroe jewellery is synonymous with a very British sense of style. It is feminine, delicate and quirky, but above all consistently wearable. We like his styles and from time to time make similar items in solid gold which draw from those same natural inspirations. Ania Haie designs are unique and that is what makes them unmistakably individual. Their pieces define the latest trend with the intention to be stacked and layered, with such unique detail they also have the attributes of a standalone centrepiece. All designed in 925 sterling silver with rhodium plating, 14 karat yellow gold plated or 14 karat rose gold plated, allowing the designs to have a luxury feel with an affordable price tag.